Establishing Buffalo in 1758, Joncaire or Indian, or Both? 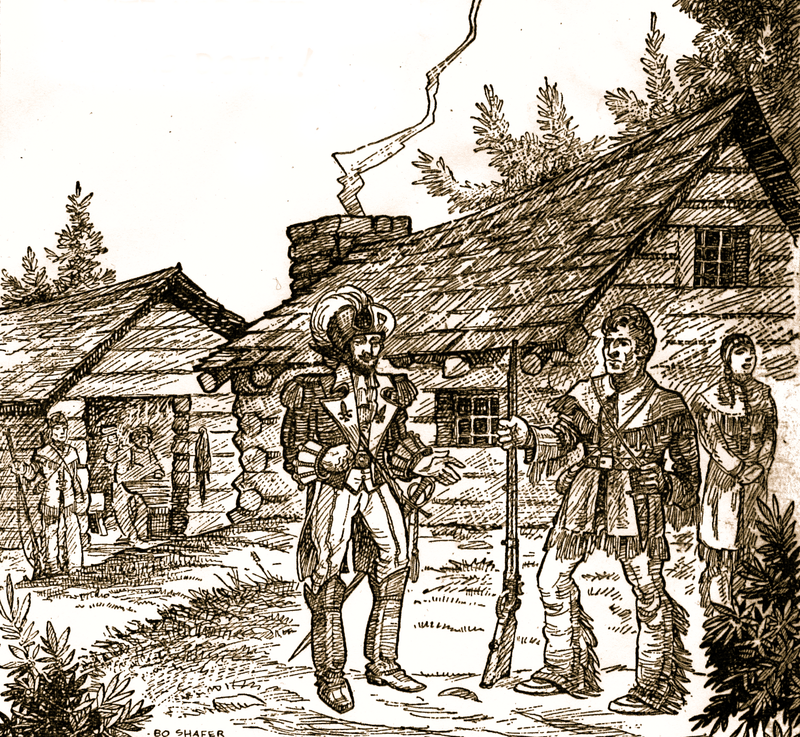 Some histories tell us that the first white settler to build within what is now the city of Buffalo was Chabert Joncaire, who established a settlement on Buffalo Creek in 1758 under the orders of the Governor of French Canada. Chabert Joncaire was neither white nor Indian. He was the son of the famed Louis Thomas de Chabert, a Frenchman of illustrious lineage, and a Seneca Indian woman. The Sieur de Chabert was called Joncaire, and to distinguish himself from his son, the son was known as Chabert Joncaire. Because the Senecas only inherited from the mother, the younger Chabert was regarded by the Senecas as an Indian, and not as a Frenchman. The Sieur de Chabert, who came to the Niagara region in the early days of the French, had great influence with the Indians--an influence that played a most important part in establishing French control of the Niagara. His son, Chabert Joncaire, had even greater control over the Indians, and through his relationship with the Seneca's he made it possible for the French to build Fort Niagara when permission to do so had previously been refused both the French and the English. 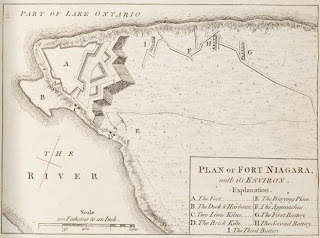 With Fort Niagara being completed in 1726 and dominating the mouth of the Niagara, the French had plans for another fort at the Lake Erie entrance to the river, and that is why Chabert Joncaire was sent to Buffalo Creek to establish a settlement in 1758. Chabert reported that he had built “a shed 100 feet long, of pine; a barn, 100 feet, with cedar timbers… a stable, a dwelling, 45 feet; a shop, 20 feet, for the blacksmith; a storehouse 25 feet long; a second barn nearly finished.” Horses were used to plow and till the fields. Corn, tobacco and hay were cultivated within an area of one half mile by three fourths of a mile. A year later Fort Niagara fell to the British, and Joncaire's project at Buffalo was abandoned until the Holland Land Company opened up this region for settlement in 1799. It Is Our Heritage: Respect It, Care For It, Use It! I have stayed there three times and slept in a silo! This hotel is very impressive, steeped in tradition of the Quaker Oats Company who had a mill to go along with the elevator. One doesn't come away thinking this an interesting hotel inside a grain elevator, the reaction is more like, "this is a magnificent hotel!" And this is by no means the only example of this type of re-use. 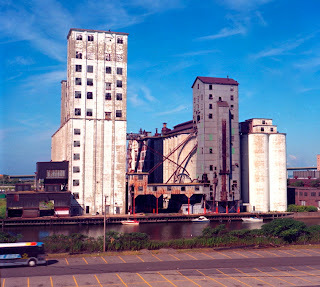 Since this was built there have been many similar reconstructions into living space in grain elevator and related mill buildings around this country and around the world. What does all this have to do with Buffalo? Plenty. One doesn't have to go back too far in the local news to find the subject of grain elevators. Defended by preservationists, historians, scholars and ordinary people from Buffalo and around the world, the grain elevators here have taken an uncalled for hit over the last few years while the City threw away grand opportunities for needed redevelopment in the interest of creating another parking lot! I don't see too many tourists flocking to Buffalo to see our historic parking lots! But tens of thousands have flocked to Buffalo to see the grain elevators over the years. The Industrial Heritage Committee, Inc. has been conducting their classic Historic Buffalo River Tours to sell out crowds for 29 seasons, attracting and educating people from all over this country and the world. The Connecting Terminal Elevator across the Buffalo River from downtown and the Saskatchewan Pool Elevator on the outer harbor would be ideal candidates for hotel development with incredible views of the lake and downtown. This is especially true now that Fuhrmann Blvd. has been rebuilt with a whole new infrastructure. Tourists going to Niagara Falls would stay in Buffalo just to say they slept in a silo! We have had out of town developers who were interested in doing a similar development here as in Akron, but were driven out of town by the politics in WNY. I'm not saying make every elevator into a hotel, but that is the obvious place to start for certain ones. There are a number of the elevators still in service storing grain including one that has just re-opened recently. The GLF/Wheeler/Agway elevator complex on Ganson St. on the other hand, is an ideal location for a working grain elevator museum to commemorate the grain elevator and milling history of Buffalo and the world. Have you ever been in a grain elevator and witnessed the monstrous marine leg descend into the hold of a ship to extract the grain? It is a site to behold that has not been done any where in the world for the public that I know of. It would have an actual grain ship docked at it's side for unloading. People would experience first hand a better understanding the scale of engineering of these structures and what it took to manage the hundreds of million bushels of grain a year that passed through these incredible buildings. You can't experience that from a book or computer. The Wheeler elevator itself is one of a kind structure, made of concrete but on the unique design of the old wooden elevators. It is definitely worth preserving for there is not another elevator like it. This is Buffalo's history and legacy, what tourists want to know about, they've told us so. There are many other ideas and examples which I do not have space to elaborate on now but will publish in booklet sometime this summer to be available on the Historic Buffalo River Tours. Buffalo's History is it's future, it is the easiest and most logical path to take for redevelopment. We have more than enough history to be proud of on our waterfront to share with others. 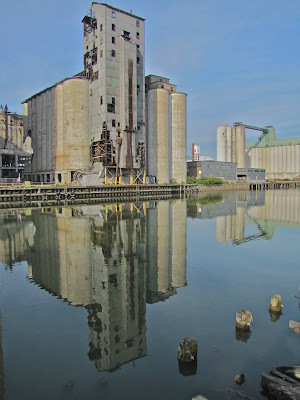 Remember, many of the beautiful mansions and classic architecture we hold so dear on our Delaware and other Avenues, were built on the backs of the grain elevator and flour milling and other commercial industries on Buffalo's Harbor. Buffalo was the birthplace of the grain elevator, the largest grain handling and flour milling port in the world for most of it's history. 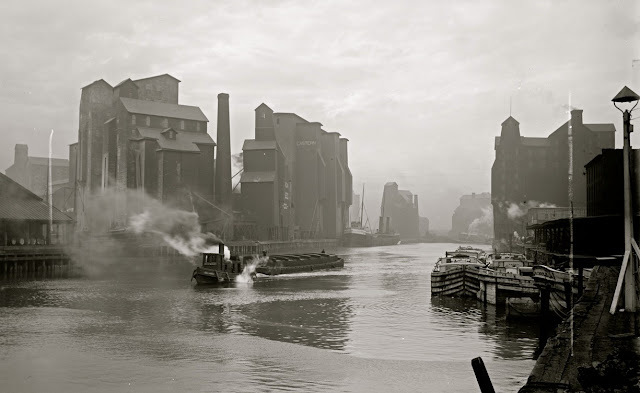 The greatest grain flow in the world was down the Great Lakes through Buffalo's grain elevators to the east coast for export. Buffalo's elevators have literally fed the world. But we treat them with the adage, "yeah, but what have you done for us lately?" Respect for ones heritage is the first step towards the re-growth of this area. History is Buffalo's future. Properly respected and done with care we can combine history with a living environment that is uniquely Buffalo, and a destination attraction for tourists. 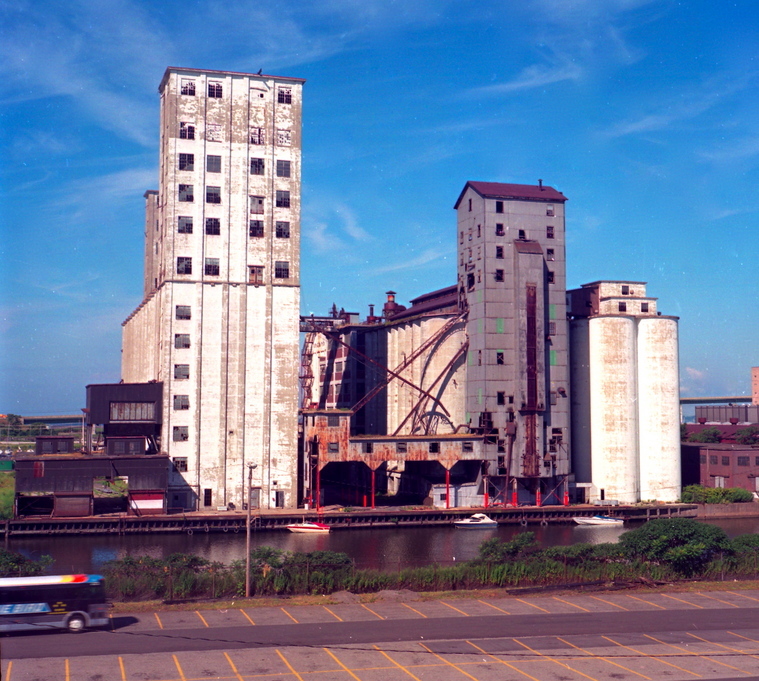 The Wheeler Elevator is one of the most significant of Buffalo’s waterfront elevators. It’s design is unique among the elevators here in Buffalo. It was an early concrete elevator but took the design characteristics of the old wooden structures from the previous century. There are no conveyor systems on top as in the modern concrete elevators. All the grain coming in from the marine tower was spouted directly into the bins. The bins themselves are all open on top, something you will never see in a conventional concrete elevator. These features are exclusive to the Wheeler and an important transition example in the evolution of grain elevator construction from wood to concrete, one which needs to be preserved. Observing the elevator recently, the main problem is the corrugated iron on the marine tower which could either be removed or repaired. As far as the elevator is concerned, an independent engineer should be brought in to ascertain it’s structural integrity, and not be left up to a demolition company, of all things, to make that assessment. Concrete holds up a lot better than most people think over the years. The reasons given for demolition is safety with an eye on expansion of the business. That is all well and good and usually a refreshing concept in the Buffalo area, and normally I would applaud their efforts. But prior to purchasing the original parcel of land I feel safe to say that they were well aware of the elevators existence, and future expansion was not suitable or easily done on this parcel. Buffalo abounds with open land suitable for the type business they have. It was not necessary or advisable to purchase the land next to the elevators (or on the water for that matter) then complain about the neighbors and lack of room. A better plan for them now, would be to look for a location elsewhere in the city which is suitable for expansion and future needs. Purchasing that original site likens to someone building a house near an airport then complain about the noise to the town and airport owners for the next ten years. It was a poor business decision, in my opinion, to locate there on Ganson Street, and not only that but wasting a water side location totally unnecessary for their type of business. That I might say is a City Hall failing to even allow it to be there. The Wheeler and GLF feed mill complex is an intricate part of our industrial heritage and a key link in future waterfront planning which is now going on. 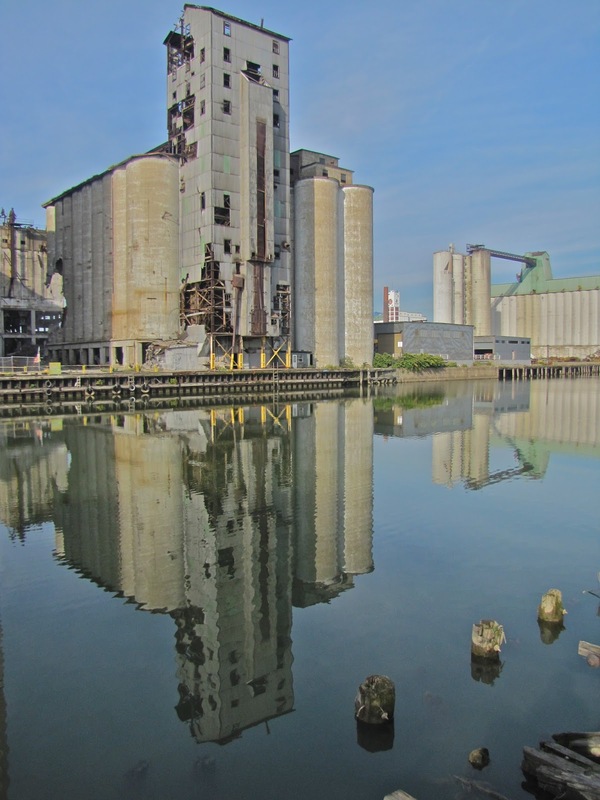 It would be a great complex for highlightng Buffalo’s grain handling and milling histories with incredible views of the waterfront from above. People in power to make decisions in Buffalo need to be aware that all the elevators in the city are individually different in many ways, and form a unique museum as a whole, of world wide significance, even as they stand today. Careful planning and patience with these structures will create a tourist attraction unlike any other in the world when linked together showing the evolution of these structures in history. This will bring more tourism dollars and prestige to the city for generations to come and far surpass anything that this company could offer in jobs or tax dollars. Although we thank them for doing business in the city, they can be elsewhere in the city and offer the same potential, if not more, for jobs and tax dollars as on Ganson Street. The Industrial Heritage Committee, Inc.